The traditional model of the sales funnel works for marketing in all types of industry. You may have read that in a perfect business environment, we would enjoy a sales ‘cylinder’ – everyone who enters at the top becomes a customer. Alas, that isn’t so. However, with quality top of funnel marketing, you can increase the number of leads who continue through the top level of the funnel into the next phase of the sales process. As a means of brief introduction for those who may be unfamiliar with the sales funnel, imagine a large, upright funnel. Consumers enter the funnel at the top. They may not realize they need your service or product to solve their particular problem; in fact, they may not realize they have a problem or need at all. At the bottom of the funnel customers exit. These people have decided to purchase your product or service. In between are strategies to breed awareness, stimulate need or want, and motivate consumers to move to the third, or bottom, tier: buying. Consumers enter at the top and hopefully a large number of them exit the bottom as customers. What Are Marketers’ Goals at the Top of the Funnel? Foremost, you are trying to generate an awareness of your company among potential customers or a target audience. In some cases, when a need for your product or service isn’t immediately obvious, you’re also educating the market at large that there’s even a problem to be solved. Your goal is more than getting the attention of your target audience; it’s convincing them that your company provides something of value. Once your company gains a reputation for providing interesting, useful information on topics about which people are concerned, they are more apt to follow you on social media and communicate with you. You are seeking a value exchange: giving something of value away for something of value in return; in this case, a lead. These items feed the needs of a broad audience while painting you as an expert in your field. Your knowledge, community service, and company ethos are on display. What Are the Key Elements of Top of the Funnel Content? The top of the sales funnel is inbound marketing at its finest. Successful top of funnel marketers determine what their audience needs and provide information and help to meet that need. Users who find quality information they can use will be grateful and remember where and who you are, in order to return. Moreover, as your audience profits by your tutelage, they become more competent in this area and are more inclined to see the need for your products or services. As an example, most of what you read here on the Solopreneur Solutions blog is an example of top of funnel marketing. The material published here seeks to provide help, tips, and information about how you can strengthen your small business and level-up your own business and marketing skills. As you participate in our solopreneur community, we hope to be top of mind when you find yourself needing digital marketing services that go beyond what you can accomplish on your own. Hopefully, our blog posts have convinced you that we know what we are talking about and can provide you with top-tier services. How Can I Begin Creating Top of Funnel Marketing Content? The simplest and quickest way to begin publishing top of funnel content is to start a blog. Begin creating quality, evergreen content in various forms that provide useful information related to your industry niche. Share your content on various social media channels with links leading back to the original page and your website. On every piece of content you publish, provide a way to contact you for more information, join a mailing list, download a free file or other lead magnet, or some way to obtain a lead for your business. Remember, this is the top of the funnel, and many who may run across your social media link may have never heard of you. It takes several views of different content post ads on social media before a user will be compelled to click the link to read your content. Don’t give up! Refine your content to make it more engaging and relevant to your audience and its needs. Use video, infographics, and more to compel internet users to view and share your content with an even larger audience. Over time, you will strike the right stride of posting and value, and leads will multiply. Continually revamp and retune your content offerings, lead magnets, and social media interactions to see what garners the best results. 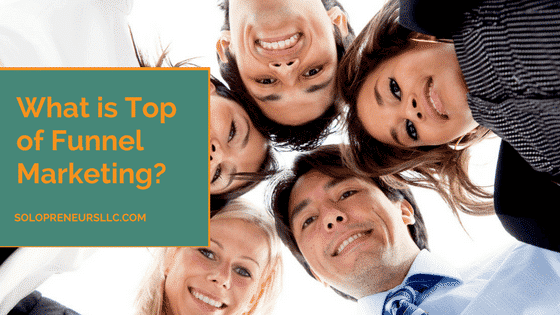 What is some of the best top of funnel marketing content you have shared? How did you create it? What seems to work best at attracting leads for your business? We’d love for you to share your ideas and stories with our readers in the comments below.